I wonder which part of this story you like best. I wonder which part of this story is the most important. I wonder if there’s part of this story we could miss out and still have all the story we need. I wonder where you are in this story. I would then also provide 3 different open-ended invitations to play with after doing the story, eg nice wooden blocks and wooden people (a combination of construction and small world), play cloths for den building or dressing up, picnic blankets, cloaks etc, and some canvases with pens and washi tape for a nice art opportunity or sticks, string and masking tape for a little structural engineering. I wouldn’t give ideas on what to do with any of them, but just set them up in a nice, inviting way and ask them if they’d like to work with one of them after you’ve done the story and wondering questions. These are questions which help us develop spiritually, however old we are. It’s something we all need, space and time to reflect and think about big things in life, who we are and where we fit into the big story of life. This can be done wherever you feel you are in terms of your faith. You don’t have to have lots of answers, just provide good space to explore. 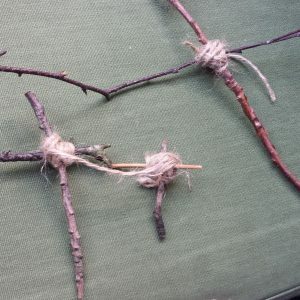 The other thing I might introduce would be some experience of some of the rituals or activities Christians do at different times of the year, for example I might take my children to an Ash Wednesday service as part of Lent, or to a Lent service where they have an Advent Wreath. You could do your versions of these at home, for example having a candle for Advent and lighting it each evening and taking a couple of minutes to say thank you for things you’re thankful for (see here for some ideas). There’s so much more I could suggest, but I think this would be an easy, but helpful starting place.